Photo: Nicco in her final stop walking to the cage for the RFA event in Albuquerque. FIT NHB’s Nicco Montano (3-2) was a “dark horse” so-to-speak when it was announced she would compete on the current season of “The Ultimate Fighter”. As most fight fans are aware, TUF is a reality television show put on by the UFC that locks up a dozen or more fighters inside a house in Las Vegas for several weeks as they train and compete tournament style to crown a winner. The episodes air on Fox Sports 1 every Wednesday night and concludes this Friday, December 1st. TUF is currently in its 26th installment and the current season is notable in that the winner will be crowned the first ever UFC Women’s Flyweight Champion. The 125-pound weight class is brand new to the UFC and this season has served as a platform to introduce the division and its first competitors. The roster featured an illustrious cast of pioneers for WMMA including former Invicta FC Champions Lauren Murphy and Barb Honchak, and perennial contenders DeAnna Bennett and Roxanne Modafferi. The season’s tournament format saw an initial seeding of each fighter to create a bracket and ranked the fighters from #1-16. Albuquerque-trained Montano was given the rank of #14 giving her long shot odds to overcome the field to become the first ever UFC Flyweight Champion. The bracket broke down so that Montano would have to defeat the #3 ranked former Invicta FC Champion and UFC vet Lauren Murphy in the first round and if the odds held up, could face #6 Montana Steward and the #2 ranked fighter, Barb Honchak, who is regarded by many to be one of the best 125ers in WMMA history. As fate would have it, that scenario would play out as Nicco overcame being the underdog on three occasions each time she found her hand raised in victory. She pulled off the upset of the season when she defeated and outpaced Murphy, battered Stewart, and out-muscled and outworked Honchak in what could be considered the surprise of the season. Now, Montano has the chance to win the season and become the newest winner of “The Ultimate Fighter” and with that, become the UFC Champion. She will mix it up with Sijara Eubanks, who was the #12 seed. After not weighing in and requiring hospitalization, finalist Sijara Eubanks has been removed from the card and will be replaced by runner-up and #1 seed Roxanne Modafferi. 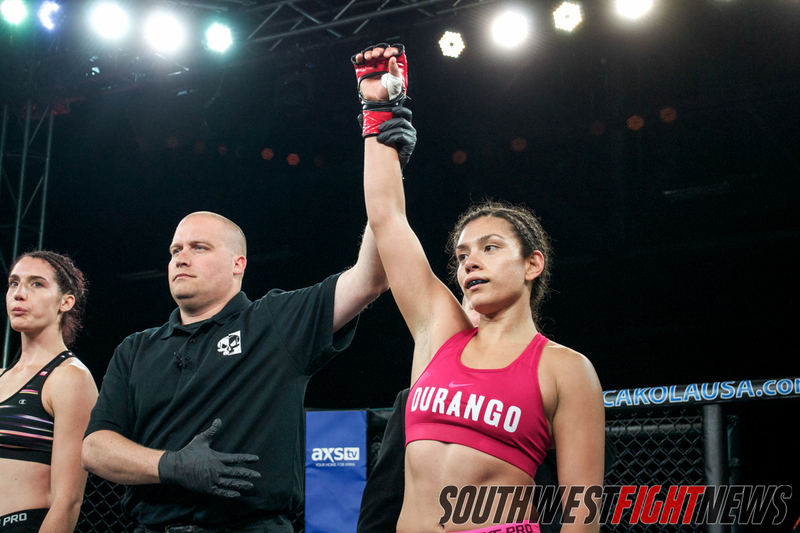 Nicco Montano has found success in this market, including a major victory for the RFA promotion in their lone visit to Albuquerque. With a win, Montano will join New Mexico MMA royalty as the newest addition to the list of fighters from New Mexico to win the show and announce themselves as players in the fight game. Back in 2005, Diego “The Nightmare” Sanchez landed on the MMA map with his performance in the inaugural season of the show. Sanchez would win the show as a Middleweight and would go on to have a successful UFC career finding the most success as a Welterweight and Lightweight competitor. Six years later in 2011, TUF 14 would feature John “The Magician” Dodson and Diego Brandao and those two (Dodson a native to NM, Brandao NM trained) would sweep the season winning the show in their respective bantamweight and featherweight brackets. Lightning must strike every six years as Montano now in 2017 will look to be the 4th fighter representing New Mexico to make it the distance and transform her status and popularity to relatively known to a household name. When season 1 featuring Sanchez concluded, he was an established veteran of the King of the Cage circuit and well-known in the State, but was launched into a pool of new fans as the season showcased his unique personality and would really lay the foundation for a career that included main event billings, world title fights, and potentially a Hall of Fame nod when he decides to hang up the gloves. In season 14, both Dodson and Brandao were regionally successful with Dodson being considered a top-5 flyweight before the UFC even introduced the weight class. An entertaining personality, Dodson would suffer from the lack of exposure of his weight division and his dynamic performances during his season would vault him to equally successful levels. Dodson would challenge for a world title, win fights at two weight classes, and will be remembered as one of the pioneers of the lighter weight classes. Brandao, a knockout machine, also gained notoriety despite not finding the same success as Dodson and Sanchez. Montano is scheduled now to compete Friday night – in her UFC debut, as a headlining act, for the Ultimate Fighter season 26 crown, and for the inaugural UFC Flyweight Championship. You couldn’t ask for a better platform to accelerate the exposure and popularity. The 28-year old Montano walked into the reality show as a complete unknown as Nicco was most known for capturing the King of the Cage Women’s Flyweight Title back in October of 2016. Though she quickly climbed the ranks in the Southwest region, he status was minimal in comparison to the competitors on the show who had already been world champions and Invicta FC veterans. Montano is poised to make the same noise that the aforementioned Sanchez and Dodson did with their success as winners of the reality show and most similar to Dodson, a fighter who was successful and well-known in this area, Montano can become a household name with one more victory on Friday night. Now fighting Modafferi, Montano will be the betting underdog both in odds and in seeding in each of her four fights and will have competed against the top three ranked competitors in the tournament. An argument can be made that with a win, Montano would become the face of the entire division having beat the women most decorated in terms of accolades and accomplishments in the 125-pound weight class. The opportunity of a lifetime awaits Montano tomorrow night, Friday, December 1st. Catch the fight on Fox Sports 1 for the Ultimate Fighter 26 Finale live from inside Park Theater in Paradise, Nevada.